Scary Monsters magazine #83 - New Thrills! And Scares! 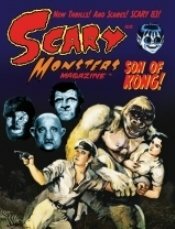 MyMovieMonsters.com > Scary Monsters Magazine > Scary Monsters 1-100 > Scary Monsters magazine #83 - New Thrills! And Scares! The 83rd Issue of Scary Monsters magazine features new thrills, and scares! It's Scary 83! 148 scary pages. All ads, contact information and website addresses appearing in this magazine are no longer in effect. Please direct all inquiries to scarymonsters@mymoviemonsters.com.